What would you say if we told you that we have a way in which you can transform your body in just 4 minutes? Sounds too good to be true? Well, not anymore. Keep reading. 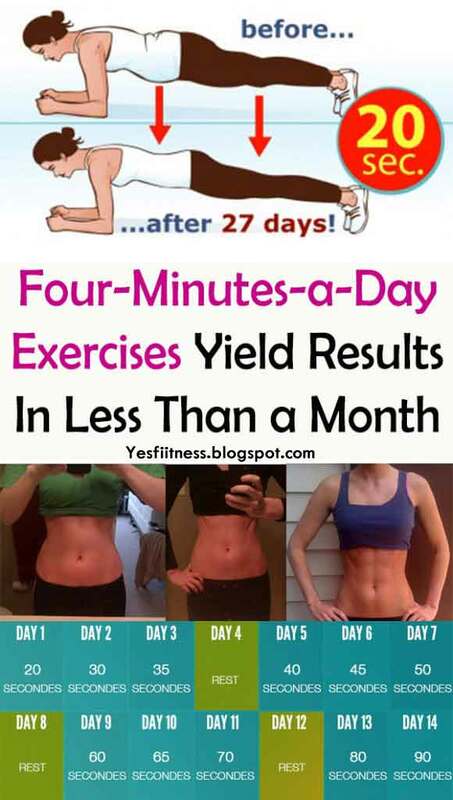 Apparently, you can achieve this not by doing tons of exercises, but just one simple exercise and that is the plank. Hence, if you want to get a great body, you have to find the strength to do the plank every day. Apart from getting a terrific body, you will increase your stamina and energy. The plank does not give immediate results, however, if you are patient, the results will be amazing. What you have to do is hold the plank for for four weeks. The first week you will have to stay in the position for 20 seconds, after a while, you should slowly and steadily increase the your stamina until you can do it for four minutes. Just follow the next plan we are about to present you. First of all, you have to make sure you have chosen the right position. This is how you should do it. Just position your hands correctly. Your elbows should be directly under the shoulders in order to ensure proper weight distribution. Your spine should remain straight. Please avoid rounding and excessive pressure on the neck and back. Just keep the legs slightly apart. You should feel your thighs. Adjust the distance between the legs as necessary and make sure your breathing is slow and your body relaxed. That is it!